have seen an increase in value in 2014 over 2013 by just over 4%. Solera is a smaller active adult community with 1,149 homes in a gated environment and fabulous amenities for the active adult lifestyle. Solera Floor plans range in size from 1151 square feet to just over 2500 square feet. The annual homeowner dues are $1,368 annually and cover all common area maintenance and basic cable service. 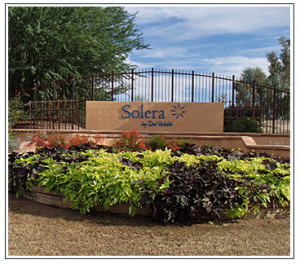 Solera is conveniently located in the East Valley of Chandler AZ just east of the Riggs Road and Gilbert Road intersection. 2014 through November 14, 44 homes have sold in Solera with an average sales price of $253,564 and average sold price per sq ft of $153.33. Homes were on the market an average of 64 days. 2013 through November 14, 60 homes sold with an average sales price of $243,442 and an average sold price per sq ft of $148.91. Homes were on the market an average of 55 days. Prices are up just over 4% year over year but buyer demand has weakened somewhat and length of time on the market is up slightly. If you are looking for an active adult lifestyle with resort amenities such as golf, tennis, swimming, fitness centers, arts, crafts, social gatherings in a warm tropical setting then Dell Webb’s Solera Community may just be the deal! Solera is only 30 minutes from Sky Harbor International Airport and 20 minutes from Mesa Gateway Regional Airport. Just outside the gates in Chandler AZ you will find world class shopping at Chandler Fashion Mall or nearby San Tan Shopping Center. Museums and art galleries are plentiful. Take in a spring training baseball game in the Cactus League – a tradition in Arizona since 1947. Visit the many parks, recreation areas and the arts in Chandler. Looking for more things to do in Chandler Arizona – just click here! To see a Kolb Team active listing in the Dell Webb Solera community see below. For more information on Dell Webb Solera community or any active adult community in the East Valley cities of Chandler, Gilbert, Queen Creek or Sun Lakes, call the Kolb Team at 480-440-0849.